Stop wasting time searching all over the web for stock market sentiment indicators. The subscriber's section of sentimenTrader.com currently updates over 90 sentiment-related guides in an easy-to-view format. For a list of available indicators, see below. For each indicator, we make available detailed background information, guidelines for use and interpretation, and historical examples. In addition, we provide a Backtesting Engine to allow users to backtest sentiment indicators against various Indexes and timeframes. Below is a snapshot of a part of our Complete List page for equities. There is also a page for bonds and one for commodities. The pages give the name and link to the indicator, what group it belongs to, its most appropriate time frame, closing value, change, date of the latest data, and a quick-glance icon that highlights any extremes in sentiment. Following is a partial list of the indicators available to subscribers. 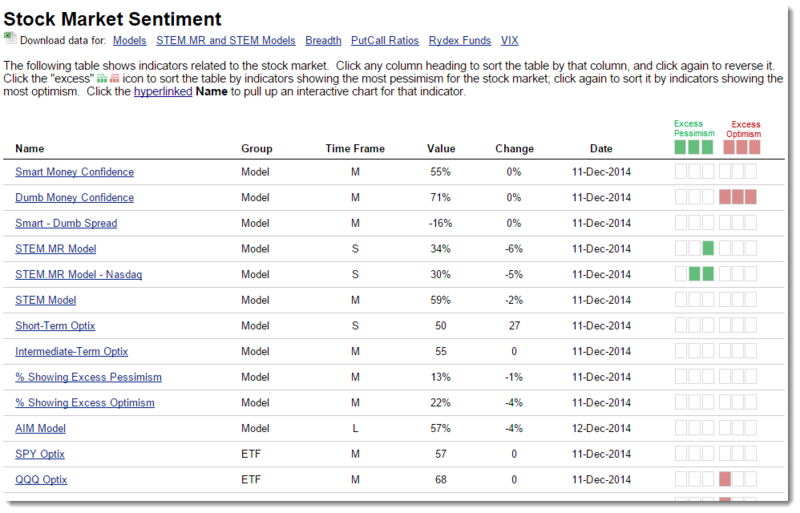 This list may change at any time, as we are continuously studying new ways of measuring investor sentiment. * Proprietary indicators, likely not found anywhere else.